February 2010 in the Washington, D.C. area via Twitter. 2010 was one of those years that left its scar on the blacktop. What was already a busy winter for the central mid-Atlantic was only a prelude for what was to come that February. It was a Friday evening, February 5th, as low pressure trudged out of the Deep South. A secondary coastal low took shape along the Carolina coastline, blinding the nation’s capital with near blizzard conditions and burying Baltimore to Philadelphia with 20” of snow. Just days later (February 9th-10th), two streams of energy merged over the mid-Atlantic and paralyzed nearly the same areas with over a foot of snow! And just when it was thought to be all over, New York City claimed their prize on February 25th as the third nor’easter of the month delivered nearly 20” to the city and roughly two and half feet to portions of the Hudson Valley. It seems to be a common theme that blockbuster storms like these are able to rally back-to-back especially in the month of February. What’s more intriguing is the climatological favored period of mid-February that so many historical storms have set their calendars on. For instance, many may still recall the Valentine’s Day Storm in 2007 that claimed so many heart-filled plans. This blizzard ravaged the Northeast layering the region with snow, sleet and freezing rain. Upwards of 1-2’ of snow and sleet fell in the interior reaches of the region from Scranton/Wilkes-Barre, PA to Albany, NY. Seven years later (2014), Cupid had similar plans as cities like Richmond and Boston received 6” of snow and ice on the eve of Valentine’s Day with over a foot of traffic halting snow and ice in the interior I-95 Corridor from Maryland to New York. Now with all of this talk about the mid-Atlantic, one might think that New England doesn’t snow as much in the month of February. 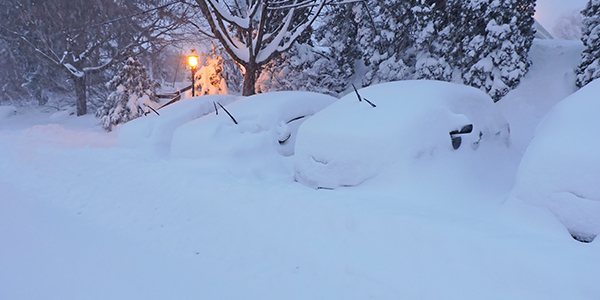 Au contraire… record snow can easily occur, like the blizzard of February 8-9, 2013, better known as ‘Nemo’, which delivered 20 – 30” of snow from Hartford to Boston and Concord (Southington, CT shown to the left). This storm made national headlines as hurricane force wind warnings were issued for the coast, and wind gusts over 60 mph led to near-zero visibility and 6 foot snowdrifts in the city of Boston. And who can forget the Blizzard of ’78, which paralyzed New Jersey to New England with one to two feet of snow with even 30-40+ inch amounts in northern RI February 5 – 7th. This amount of snow combined with another round of hurricane force winds created massive drifts of 15 feet, knocked out power, and stranded up to 3500 motorists on highways. Even the National Guard was called to help with recovery efforts. Now despite all the record snow and the relentless cold artic outbreaks, February has been forgiving at times allowing for a brief thaw and a moment of hope for those eagerly looking forward to spring. Only time will tell what the rest of February will bring; maybe more sleet and freezing rain or perhaps yet another blockbuster snow storm to go down in the history books to satisfy the craving of those still yearning for snow.